With DBF Viewer 2000 you can export dbf to Excel (XLS, XLSX) from GUI or from the command line. To export a dbf file to XLS (Excel) format, open File | Save as/Export menu, and select file type: XLS or XLSX (Excel 2003-2017). "Export DBF to XLS" dialog box opens. Select the fields to be exported and specify their order using up and down arrows. 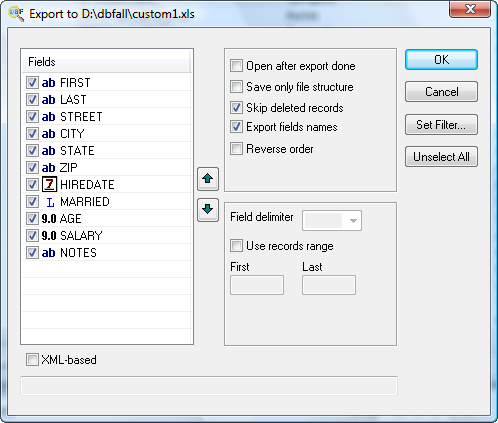 DBF Viewer 2000 allows you export memo fields (from .fpt/.dbt files) to XLS/XLSX format. To export large memo fields, set on option "XML-based"